Homelessness is a pressing issue; it’s estimated that around 400,000 individuals are sleeping rough each night in the UK. By transferring business and economic skills, Homemade aims to break the cycle of homelessness and enable the homeless to once again become financially stable and self-sufficient. Initially we carried out a needs assessment, through one-on-one interviews, which identified the areas of need for individuals within the project. This is an important aspect as each of the beneficiaries that we work with come from have issues with social mobility and therefore have specific needs. In particular we noted that there was a lack of confidence and a gap in their CVs. Within the Homemade project, beneficiaries have a one-to-one mentor who ensures that the individual’s experience of the project is tailored to their individual needs assessment, a consideration which means that the project can use its resources and framework to provide opportunities despite their socioeconomic background. This year we have worked to exit this project sustainably, and have handed it over and as a result of the newly freed up resources we can focus on meeting new needs of our young beneficiaries. We can also provide more tailored, individual solutions to the same homeless beneficiaries, allowing them to unlock their own potential. The project was built entirely around the needs and wants of our beneficiaries. We consistently found a lack of enterprise and employability skills and therefore we have framed our project around these. The project consists of empowering our beneficiaries to make, market and sell products as part of the running of an up-cycling business. This successfully meets most of these needs whilst also allowing beneficiaries to develop soft skills such as team working and leadership. Recording this progress allows beneficiaries to use these as real-world examples of employability skills in interview situations. Our project is an innately innovative one. Our weekly sessions with our beneficiaries are centered around being resourceful and creating beautiful and commercially viable home-ware items from materials that would otherwise be discarded. Alongside our environmental considerations, our sessions emphasize creativity and empowerment and provide beneficiaries with the opportunity both to express themselves and to develop knowledge and skills to increase their employability. This year this has led to 7 individuals gaining employment and for four of them we have broken the cycle of homelessness as they have gained permanent housing. For those who have not yet achieved this we continue to work with them one-to-one helping them to achieve their goals. Instead of a focus on scaling, this project has been successfully exited this year. A local organisation knew of the success of Homemade and using our project plans and needs assessments received a Big Lottery Fund Grant to fund its expansion. We worked collaboratively to transfer skills over a time period, they now provide the money, time and mentoring to run the upcycling sessions within the shelter each week. We are now researching how to meet the needs of the homeless in new and entrepreneurial ways because we have freed up human and financial resources. When we meet our beneficiaries they are homeless and some of them are as young as 16 with nobody to turn to. I’ve seen the journey on which our Enactus mentors support these beneficiaries. I’ve seen people who society thought had no potential turn into valued members of my own community - working for the council mowing lawns or serving meals in a cafe. I know Homemade profits funded the suit and bus travel to get to the interview, and the money they’re now making can support them and their families. 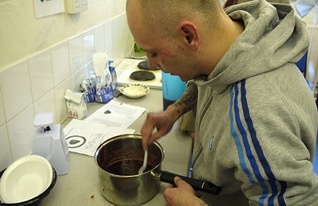 To see beneficiaries become equal members of society in Sheffield and fully reintegrated is one of my proudest moments.